It would seem, what could be easier than to make a wooden wheel for carts, and in fact make it quite difficult. This wheel can be useful not only in the manufacture of a cart or wheelbarrow, it can serve as exquisite decoration of the yard and bring some flavor to the landscape design of your country house and also used for other purposes. Take a sheet of drawing paper, plywood or cardboard and draw on it the wheel, which we plan to make. The scale of the wheels must be real. Mainly the drawing is necessary in order to determine the sizes of the segments of the manufactured wheels and spokes in its natural size. As a rule, the correct number of spokes and sectors must equal twelve. Prepare the wood to work, it needs to be dry. It is best to give preference to the most solid rocks. If the wheel is just decorative element, you can use a softer wood. Take the steel strip whose thickness is approximately 4 mm. From it will be made of bandages. Pull the ends of the plate on itself, and connect them overlap, making the entire length of the joint rivet. Weld the edges of the holes in either end of the strip to each other. Run the pipe from the hub. It is important to know that you need to start with themselves bandages, and the wooden rim gradually tighten the steel brace. Build wheels. To begin work on assembling it is necessary from the tip of bandages on the hub. Score the inside of the hub on one of the steel sleeve. Make small furrows in the ground where you will sit down the spokes, in order that the air went out of the nests. Install the spokes in the sockets of the hub, and after they install all the necessary segments. Heat bandage so that its inner diameter equal to the diameter of the rim of a wheel, on which he will be impaled. The stronger the heated band, the easier it will be to impose it on the rim. For heating you can use a simple fire or a horn. Attach the brace to the rim. As the bandage was pre-heated, when it cools down it will shrink in size and tightly connects all parts of the wheel. Let the wheel cool down, and it is ready for use. It can be mounted on a cart or used for another purpose. 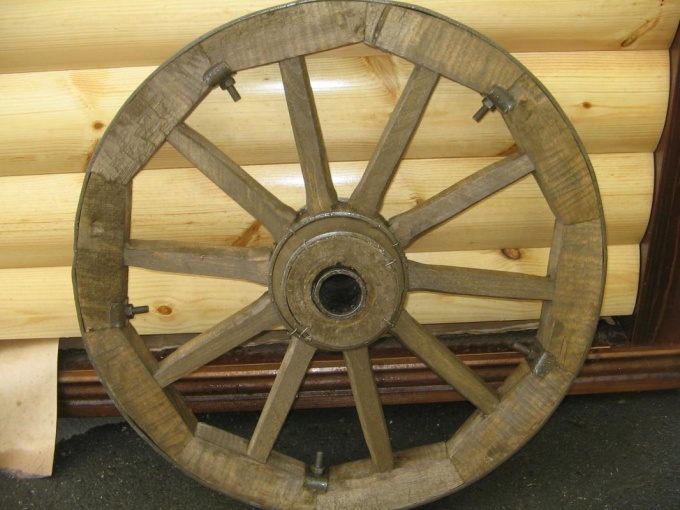 I would like to mention that the wooden wheel of the cart consists of a rim, spokes, hub, and necessary metal parts such as bushings and tires.